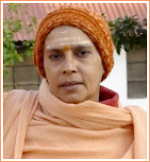 Swami Satyasangananda Saraswati (Satsangi) was born in 1953, in Chandornagore, West Bengal. From the age of 22, she experienced a series of inner awakenings which led her to her guru, Swami Satyananda. Human life is the only life where man is given freedom of action. Do not therefore waste time but start on your journey. Carry with you the luggage in the form of blessings and instructions of the Guru. Always cherish this thought within that you are nobody. Whatever there is, is only that Power, that you are only the medium. Never forget that while one force desires to manifest itself through you, the other desires to efface you. First know him to be the Doer in all ordinary matters. Slowly as this practice matures, you will be convinced that you are the same entity. If the disciple wants to be enlightened, he will find an enlightened Guru. There is no doubt about it. The attitude of a disciple should be: ‘I am nothing. I am the medium. I am the channel’. This attitude has to be perfected day in and day out. This is bhakti or total self-surrender. Guru and disciple may live anywhere, but there is an unseen connection between them. Individual mind is only a concept, it is nothing. There is no individual mind, only universal. Since you are part of the universal mind, the guru can converse with you from any point and at any point. When you feel you are in touch with divinity, you are very much in touch with your Guru. Once the link with guru is established, time cannot change it, nor death eradicate it. It is a permanent union. Guru stays with you life after life. Gurus are those who descend with the particle of divinity from the higher realm of awareness to our plane of consciousness. There is no need to escape life. Live it, live it fully. Live it blissfully. Harmonise it. Awaken your infinite potential. This is the very essence of Sannyasa. Whatever a Sannyasin does, whether he has possessions or not, whether he lives in an ashram or under the open sky, his inner feeling should be of renunciation as much as he is able. Actually, the ultimate role of a Sannyasin is to have absolutely no role. This means that though he may perform a useful role in society, internally he feels no role. This is perfection in Sannyasa life, to play a role without any identification with it. In order to receive Guru’s grace, you must live constantly in communion with the Guru. Initiation is a very sacred commitment between Guru and disciple. Guru can love everyone because he sees one in all. In the same way, whoever your Guru is, you have to see all Gurus in him. The aim of a Sannyasin is to attain perfection, to refine his body-mind so that it becomes a perfect instrument. Face the storms and earthquakes! Don’t be shocked, don’t fall down. Keep on standing majestically. Surrender is not giving up your freedom, but receiving your freedom, like a king. When you surrender to Guru, you give your limited self away and receive it back again in fullness. The Guru-Shishya communion is the most enduring type of relationship mankind has ever known. It transcends experiences and emotions, and continues to work in its own non-rational way even after death. The test does not lie in how much Sadhana you have practiced but how alive are you to your Sankalpa. A Sadhaka must always remember his Sankalpa (firm resolve). You have a great mission to fulfill, for that every step of your life is a mighty system of preparation. You don’t have to defend yourself. You have to equip yourself with a greater form of awareness. That greater form of awareness makes you brave, bold and it gives a meaning, an understanding to every experience in life. A true Guru does not make the disciple renounce the world but his limited self. Even if you only live the life of a Sannyasin for fifteen days, it will enrich you with very deep and abiding experiences and it will create a new type of mind, personality and man. Simple life is a veritable blessing, because it makes one free from cravings and desires, which cause suffering and pain. With total abandonment of desires comes their complete fulfillment. First you practice egolessness before your Guru and when you practice this for sometime, it becomes your nature. When it becomes your nature, you can practise it with anybody and everybody. The real Guru is within you, he is known as Sat Guru. The external Guru acts as a catalyst and explodes the experience of the inner Guru. Guru represents the full moon because Guru represents the highest order of illumination for which a disciple is striving. The full moon represents total enlightenment. Sannyasa means accepting the challenges of life and fighting it. Let people come forward for Sannyasa and Karma Sannyasa. Respect all systems, all philosophies and all religions, that is the only way for growth in spiritual life. You should see no difference in the different paths and that is how you go ahead in spiritual life. Gurus do not perform miracles for they are beyond the psychic plane, high up on the spiritual plane, where they never exhibit Siddhis (psychic powers). You are the full time servant of mankind. Surrender to Guru or to God does not mean that your life is paralysed. It only means that there is no difference between you and the Guru. Bihar School of Yoga publications are now available for sale in Satyananda Yoga Centre Mambalam. Satyananda Yoga Centre Mambalam, a Unit of Satyam Yoga Trust, has rich experience in helping corporates transform their workforce into a productive outfit. We have worked with Public Sector and private companies including IT companies. Companies all over the world today are lot more insecure than ever before. With the opening up of the economy in all nations, corporates are faced with global competition. There is also an ever increasing threat to continuity of business with take-overs and acquisitions emerging as key strategies for companies to consolidate, protect and grow their interest. Intense research work around the globe, rapid technological advancement and continuous innovation also pose big threat to current technologies and product. Given this scenario, every company wishing to survive and aspiring to make it big, naturally needs to be on their toes. High work targets, long work hours, night shifts and insufficient holidays have become practical realities of this extremely competitive, volatile global corporate environment. Unfortunately, stress too has become an evil companion in this scenario. It has reduced the efficiency and health of the affected individuals, eventually making them less productive and less effective. We at Satyananda Yoga Centre Mambalam understand this reality very well. While you cannot change the environment and what is needed to survive and be successful in this environment, what is certainly in your control is how you prepare yourselves to face this reality and how you respond to it. With the help of an expert, one can certainly learn to manage stress and how to deal with it. But, undeniably, you need to choose the right tool and teacher. Satyananda Yoga and Satyananda Yoga Centres could be your solution.